Each one of these species of monkey has a strange appearance that sets it apart from all the others. Here’s a few weird looking monkeys, and it’s up to you to decide, are they so cute that they look weird, or so weird looking, that they’re just adorable? Considered sacred by the people in the Himalayan region, the golden langur has little black face peering out from gold, rust, or sometimes cream-coloured fur. Sadly, they are endangered, so there are very few of them left. This tiny monkey lives in Central and South America. 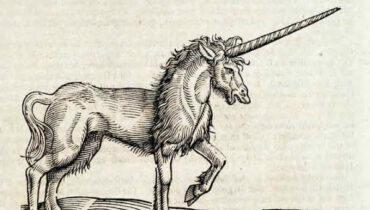 One can’t help but smile at the regal, yet amusing moustache from which the animal has earned its nickname. Even the babies and females of the species have some moustache stubble when they’re born. 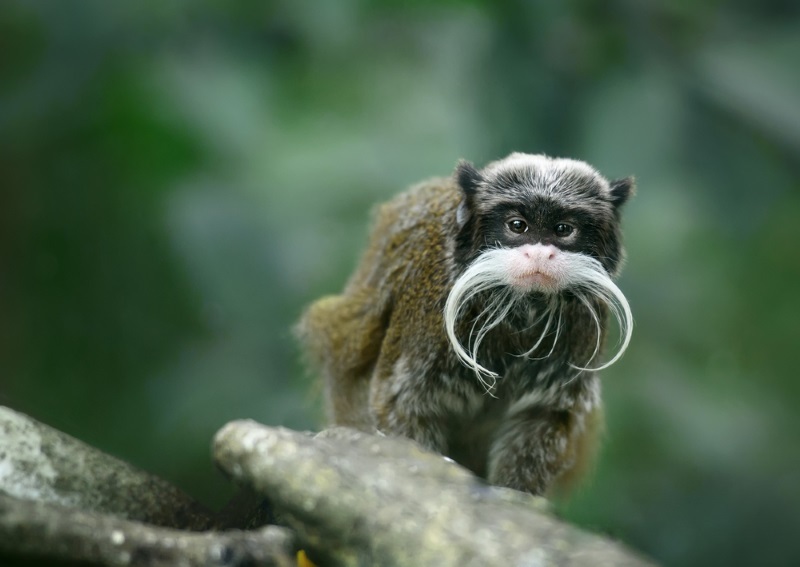 One of the most colourful varieties of primate, the red-shanked douc looks as if it’s attired in red trousers, long white gloves and a multi-coloured shirt. Its soft face and almond-shaped eyes are colourful as well, and almost give the appearance of a monkey in theatre make up. This is not a monkey in a silly mask, nor is it a bear in disguise. 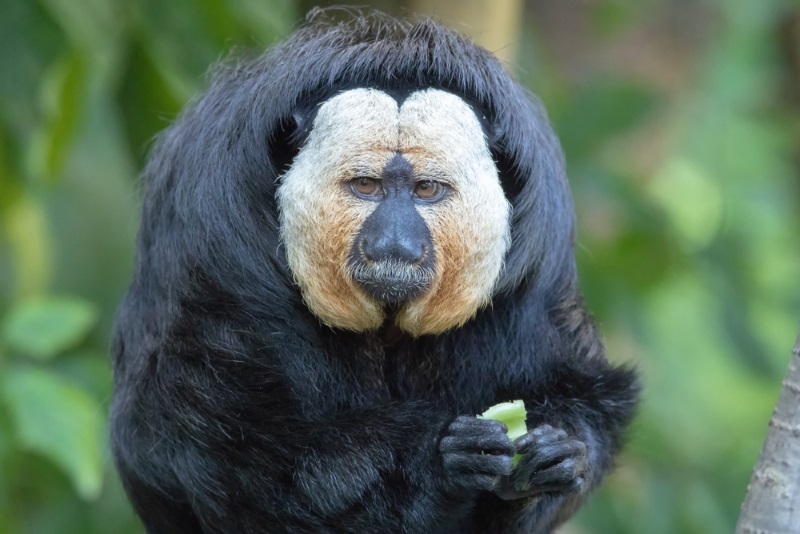 The South American white-faced saki has a distinctive appearance, though it’s only the males of the species who look this way, as the females generally remain a brownish shade from head to toe throughout the course of their lives. 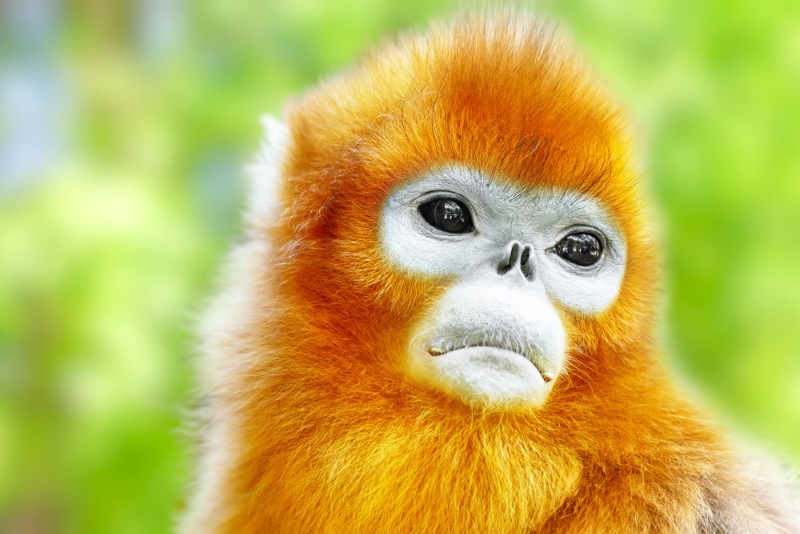 The golden snub-nosed monkey spends its time in the mountainous forests in and around China. Generally quite small with soft, golden fur and a tiny, snub nose like the name suggests, this monkey thrives in cold weather. But don’t let the appearance or cute name fool you. These monkeys are quite capable of chasing off larger predators, such as leopards and other fierce animals. 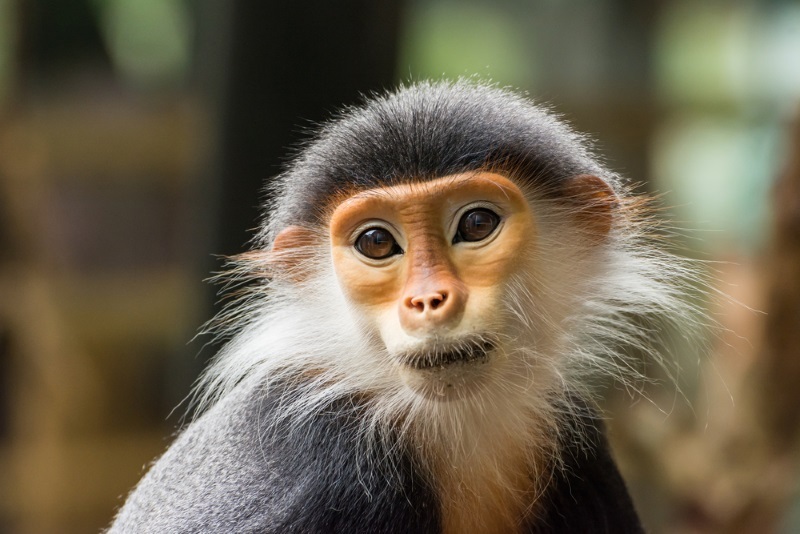 These shy primates are sometimes referred to as “swamp monkeys” and tend to avoid other monkey species. In spite of their strange and unique appearance, they are actually quite good at camouflaging themselves when needed. 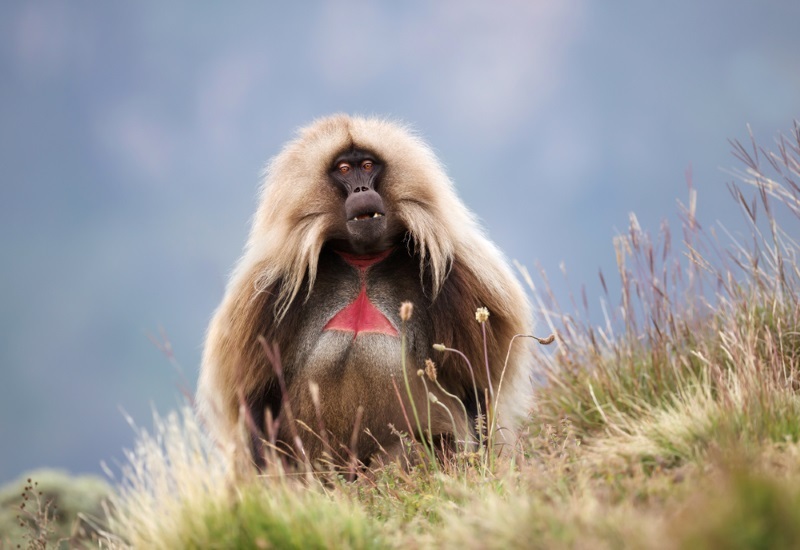 While the Gelada is often referred to as a baboon, in truth, it is closely related to baboons, but is technically not a baboon itself. Aside from their distinct appearance and wild-looking mane of fur that encircles their faces, another trait that separates the Gelada from other monkeys is the tendency to sit on the ground and snack on grass that they pull out by hand, as opposed to sitting up in tree branches while munching on fruits and insects. 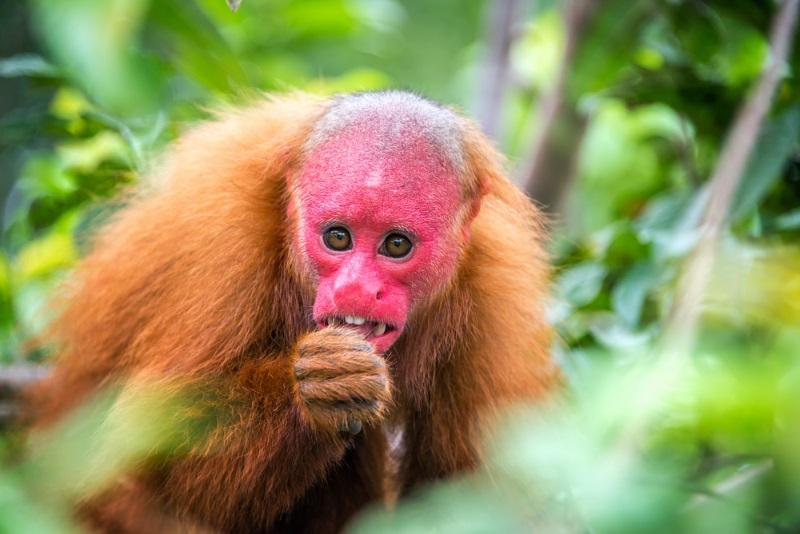 The bald-headed uakari has a striking appearance with its bright red face and little bald head, but among the other bald uakari, the redder the face, the more attractive you are. 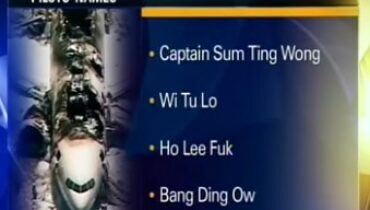 These little primates are highly intelligent, very social, and have powerful jaws that are strong enough to crack open nuts that other types of monkeys have to avoid. The bizarre looking Tarsier almost resembles a lemur more than an actual monkey with its strange, long twig-like fingers and huge, bulging eyes. The Tarsier is nocturnal, and if its appearance wasn’t weird enough, Tarsiers also have high-pitched voices which they often use for singing. They cannot walk, so they’re forced to hop around, and if they are disturbed by unwanted touching or loud noise, they are prone to committing suicide by banging their head on a hard surface. Quite likely the weirdest looking monkey on this list, the Proboscis Monkey is known for its unique, over-sized nose. This large nose, while somewhat clownish and comical, is actually used to warn off predators or attract mates by making a large bellowing noise. Not only do they have the biggest nose among all the primates; they also happen to be excellent swimmers.